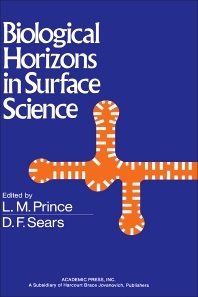 Biological Horizons in Surface Science presents techniques used in surface science research as well as experimental data. It is organized in such a way that there is a transition from the more theoretical or molecular to the more biological. Emphasis is placed on the importance of water in determining molecular architecture and interactions. Methods of examining molecular associations and complex formation of molecules are discussed, and the results from such studies are reviewed. Permeability is examined from the point of view of the energies required to penetrate between two different phases, and from the role that multicellular membranes may play in directing the diffusion of ions or solutes in general. Current concepts of membrane structure based on membrane models are discussed and some new models are suggested. Application of surface science techniques and the unique energies present at interphases are considered with regard to drug interaction with biological tissue and immunological phenomena. The importance of surfactant protein-lipid association is also discussed in regard to alveolar mechanics. This book is directed particularly to biologists who will find many of the techniques used of significance in their own research. It also aims to interest graduate students in this area of investigation.